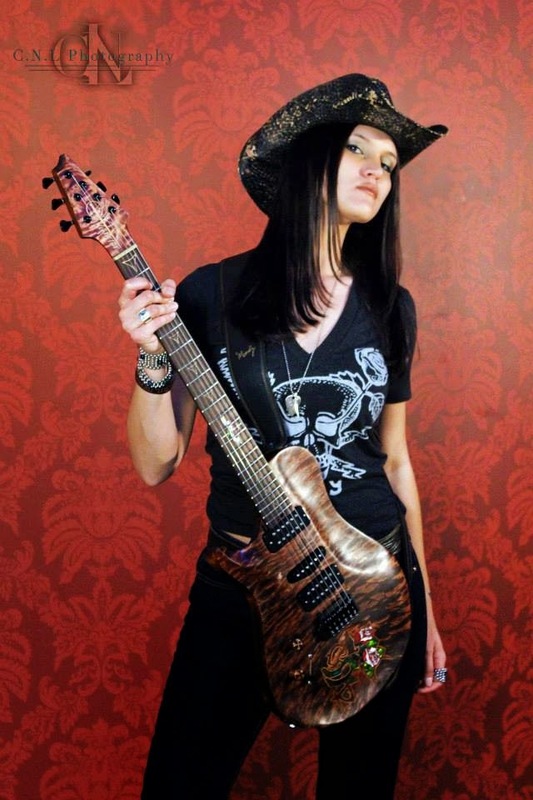 LOS ANGELES, CALIF. - For the fifth consecutive year, 8-time music award winner and female Southern Rock artist/guitarist, Glitter Rose has been invited to perform at Dallas International Guitar Festival representing Gibson Acoustic Guitars and Warrior Guitar, along with her other 11 endorsements Orange Amps, Fishman Acoustic Amplification, Asterope Cables, Rotosound Music Strings, DiMarzio, Telefunken Elektroakustik, BAE Audio, Moody Leather, Rebel Boards, Montarbo and Guitar Hands Hand Care. On Saturday, May 3rd Glitter will perform at the 38th Annual DIGF and share the stage with some of the biggest names in music including Johnny Winter (Muddy Waters), George Lynch (Dokken), Andy Timmons (Danger, Danger), Redd Volkaert, Derek St. Holmes (Ted Nugent), Chris Rodriguez (Faith Hill), and many more highly respected artists. Glitter Rose’s music is breaking ground as the new sound of Southern Rock meets Country. In 2013, the 28-year-old Texan was recognized with two awards including Best Rock Artist and she received the Album of the Year Award for Dead or Alive at the 2013 Artists In Music Awards at Key Club in Hollywood, CA. In April, Glitter earned the title for Best Music Video for her song “Buda Negra” at the 14th Annual Bare Bones International Film Festival in Muskogee, OK. Later that month, Glitter was honored with the prestigious nomination for Texas State Artist – State Musician by the Texas Commission of the Arts. Glitter was also chosen as one of the three finalists in Hard Rock Rising’s 2013 Global Battle of the Bands. Then in November, Glitter was honored at the 23rd Annual Los Angeles Music Awards when she took home the award for Country Artist of the Year. Glitter took home four additional awards for Artist of the Year, Performer of the Year, Best Southern Rock Artist, and Best Music Video at the 3rd Annual Artists In Music Awards held at Jon Lovitz Theatre in Hollywood, CA on Friday, February 7, 2014. 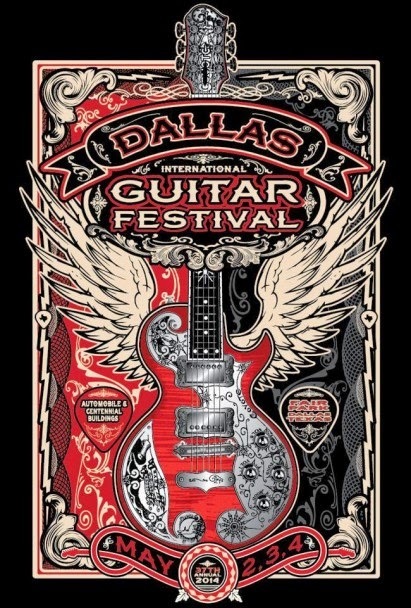 The Dallas International Guitar Festival Show is the oldest and largest guitar festival show in the world! Today there are more than 2,000 guitar shows and festivals staged around the world, but the guitar show phenomenon actually began in Texas with the vision of Dallas guitar shop owner Charley Wirz. Charley conceived the idea of establishing and promoting a vintage guitar show similar to other collectible shows, with booths leased to dealers and collectors. Build it and they will come, he thought. And they did. In partnership with John Brinkmann and Danny Thorpe, he staged the first Dallas guitar show. The partnership was dissolved after the 1981 show and Charley continued to stage the Dallas show until his untimely death in 1985. That first show – the Greater Southwest Vintage Guitar Show – was a modest success for the 10 exhibitors who leased booth space to show off and sell their prized vintage guitars. Each year, the Show attracted more exhibitors and attendees, changing venues to accommodate the growing crowds. But in 1985, show founder Charley Wirz died unexpectedly. Charley’s Guitar Shop and the rights to the Guitar Show were then purchased by Mark Pollock, one of Charley’s closest friends, a good customer and a touring musician himself. Mark had some ideas about the show’s size and location, so he began a series of changes that have led to its prominence today. Mark’s first big change was to expand the show by moving its location to the Dallas Convention Center. He envisioned bringing together both guitar purists and everyday music fans, so he hosted a party on Saturday night and hired some outstanding musicians to entertain. Thus, the annual Saturday Night Jam was born. In 1989, Mark initiated a second major change by bringing guitarist and 1978 Show exhibitor Jimmy Wallace in as his partner. A record 10,000 attendees moved through the gates the following year and Mark and Jimmy were onto something. The Dallas show kept growing and Mark and Jimmy moved the location to Dallas’ Fair Park in 1996. In 1997, the 20th annual show was expanded to include Music Fest, a celebration of local, regional and national bands performing on two stages throughout the weekend. This was Mark and Jimmy’s third major change and it added even more appeal to the general public. The Festival’s final year at the State Fairgrounds was marked with the honor of being asked to participate in the first of Eric Clapton’s Crossroads Guitar Festival by presenting the Vintage Guitar Showcase during the three day, star studded weekend. In 2004 Mark and Jimmy moved the show to Market Hall; the largest privately-owned exhibition hall in the USA. To accommodate more vendors, more music and its inevitable growth, the show will return to its former home at Dallas’ Fair Park in 2014, occupying both Automobile Buildings – making it the biggest the show has ever been! For 2014, there will be more artists in attendance, performing and mingling with the attendees throughout three days of guitar heaven. This is the original guitar show, the first of its kind in the nation, and 2014 promises even more innovation and surprises for all. Please join us for THE guitar event of the year!